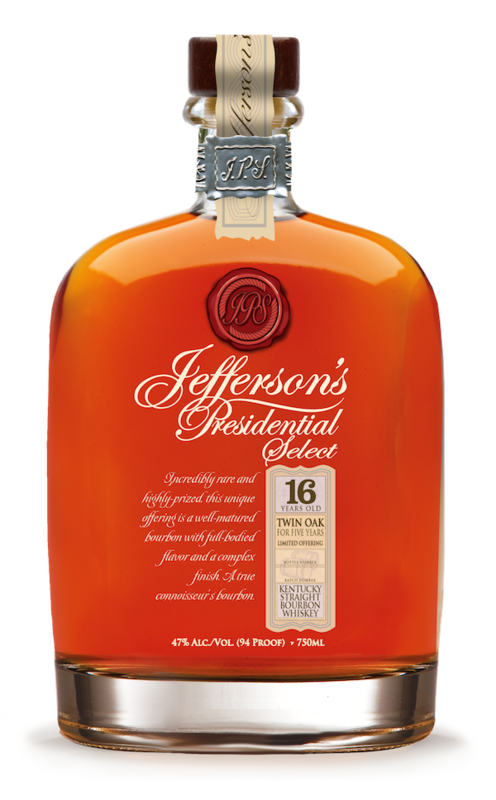 Jefferson’s Bourbon tells BoubonBlog.com they are releasing Jefferson’s Presidential Select 16 Year Old Bourbon. This week, the exceptionally rare expression of Jefferson’s Bourbon Whiskey will be released at $199.99 / 750 ml bottle. Only 10,000 bottles have been produced at 47% ABV / 94 proof. The bourbon, which started as a straight Kentucky Bourbon whiskey, was first fully matured for 10 years in the traditional style of aging in new charred American Oak barrels. From there, the Bourbon was dumped from the original barrels and transferred to brand new charred oak barrels and aged an additional 6 years. The result of being aged in new charred oak twice during the maturation caused the Bourbon retain the bright notes found in a classic Bourbon but also adds a depth of flavor and complexity that can be gained only through long years of extra aging in new barrels. Jefferson’s Bourbon tells us that this rare expression is a tribute to the brand’s namesake, Thomas Jefferson. They say the whiskey is poised to be a collectible classic, following in the footsteps of the original Jefferson’s Presidential Select. To be first to learn about Bourbon news and new whiskey releases, subscribe to our newsletter on this link.